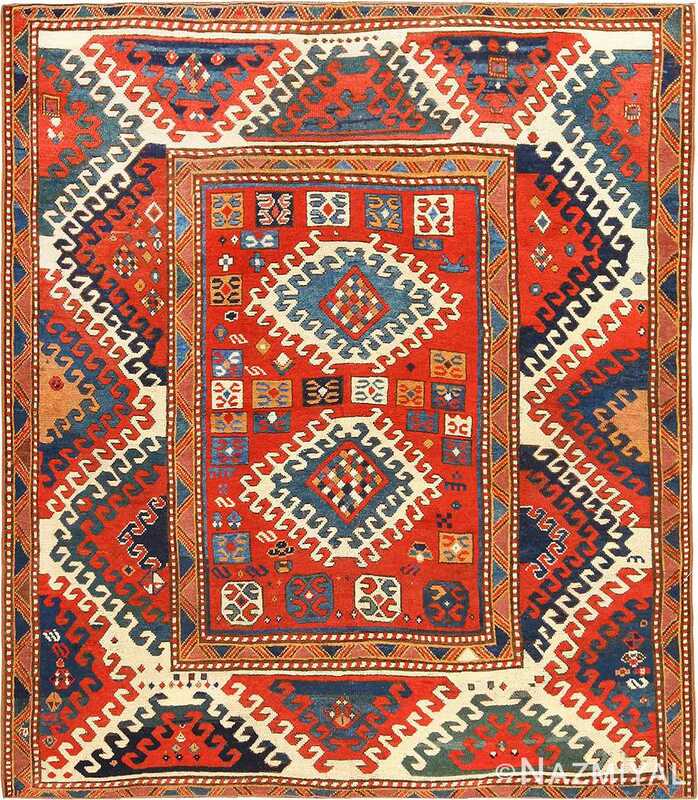 Borchalou rugs, also called Bordjalou or Borchaly, are one of the most important regional carpet groups in the western Caucasus. Dagestan, Shirvan, Kuba and Baku are famous for their decorative rugs. However, Borchalou is no less important. The historic Bordjalu Khanate encompassed the region between Georgia, Armenia and Azerbaijan and extending eastward toward Turkey. Nomadic groups and political turmoil obscure the history of the Borchalou name, which is linked to tribal groups from the time of Ghengis Khan as well as the Georgian city of Borchalo, now called Marneuli. Marneuli, Bolnisi and Gardabani are the largest villages in the district. However, unique designs also come from Karachopf and Kuttar. The latter is famous for its Kazak pinwheel rugs. Historically, geographic and economic conditions required villagers to travel to a central point to sell their items. In the south, the cities of Gazakh and Gendje earned a reputation for fine antique rugs, and it’s likely that the city of Marneuli was the most accessible market point in the north. The Borchalou designation includes several important Kazak and Caucasian design groups. These extremely decorative carpets have graphic rectilinear designs, fantastic monochrome spaces and high-contrast colors, including clear green, blue-green and vibrant cochineal red. Diamond-shaped latch-hooks are the basis of prototypical Borchalou rugs, but compartmental medallions, stacked lozenges, animals and iconographic symbols were also used. Split polygons with latchhook edges are one of the most common Borchalou border motifs. Complex counterchange figures are common too. Caucasian Borchalou Kazak rugs should not be confused with Persian Borchalous that feature well-defined floral decorations and Hamadan-style medallions. These carpets from Persia’s Arak district are associated with a distant offshoot of the Borchali tribes, who migrated to the area nearly 1,000 years ago. Caucasian Borchalou rugs have a classic village style with strong tribal decorations that are beloved by collectors and perfectly suited for rustic and modern spaces.